inner of the Houshang Pourshariati Iranian Studies Book Award 2009, this beautifully illustrated history of Safavid Isfahan (1501-1722) explores the architectural and urban forms and networks of socio-cultural action that reflected a distinctly early-modern and Perso-Shi’i practice of kingship. An immense building campaign, initiated in 1590-91 at the millennial threshold of the Islamic calendar (1000 A.H.), transformed Isfahan from a provincial, medieval, and largely Sunni city into an urban-centered representation of the first Imami Shi’i empire in the history of Islam. 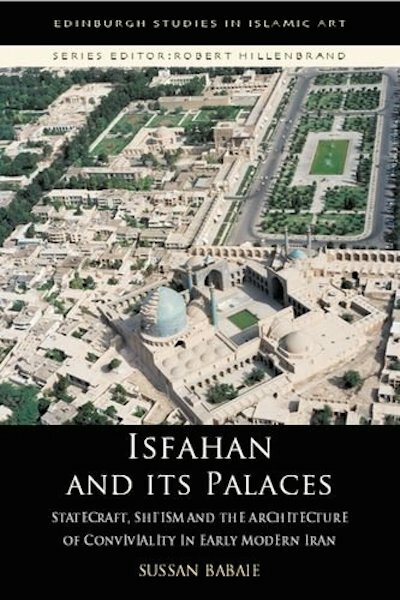 The historical process of Shi’ification of Safavid Iran and the deployment of the arts in situating the shifts in the politico-religious agenda of the imperial household informs Sussan Babaie’s study of palatial architecture and urban environments of Isfahan and the earlier capitals of Tabriz and Qazvin. Dr Babaie argues that since the Safavid claim presumed the inheritance both of the charisma of the Shi’i Imams and of the aura of royal splendor integral to ancient Persian notions of kingship, a ceremonial regime was gradually devised in which access and proximity to the shah assumed the contours of an institutionalized form of feasting. Talar-palaces, a new typology in Islamic palatial designs, and the urban-spatial articulation of access and proximity are the architectural anchors of this argument. Cast in the comparative light of urban spaces and palace complexes elsewhere and earlier in the Timurid, Ottoman, and Mughal realms as well as in the early modern European capitals, Safavid Isfahan emerges as the epitome of a new architectural-urban paradigm in the early modern age. Dr Sussan Babaie joined The Courtauld Institute of Art, University of London in 2013 to take up a newly established post teaching on the arts of Iran and Islam. Born in Iran, she attended the University of Tehran’s Faculty of Fine Arts until the revolution of 1979 when she moved to the USA to study for a Master’s degree in Italian Renaissance and American Arts, followed by a PhD at the Institute of Fine Arts, NYU, where she focused on the arts of Islam. She has many years of experience teaching in America, at Smith College and the University of Michigan, and as a Visiting Professor at the Institut für Kunstgeschichte, Ludwig Maximilian University, in Munich. Her research and teaching concern questions of imperialism and artistic patronage in Persianate West, Central and South Asia where high culture derived from the literary corpus of the Persian language. Most recently, her research has been supported by grants from the United States National Endowment for the Humanities, the Fulbright (for research in Egypt and Syria) and the Getty Research Institute in Los Angeles.